Ascott is one of the best gardens I've seen this summer, in terms of grand design and planting. The timber-beamed house (above) was once a simple farmhouse, acquired by Baron Meyer de Rothschild in 1873, but transformed into the grand edifice there today by his nephew Leopold. 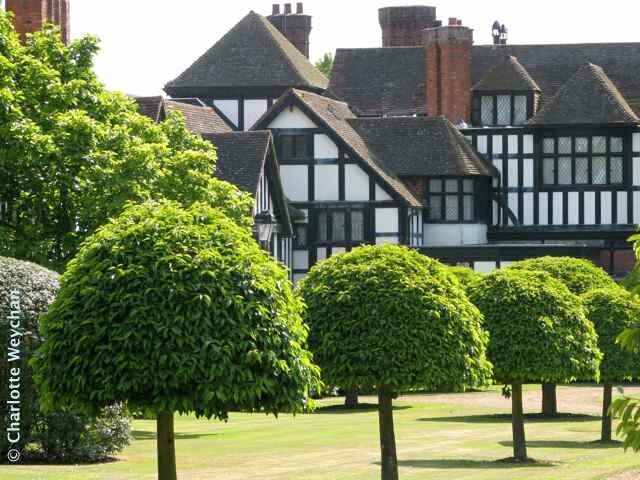 It sits in 30-acres of gloriously landscaped gardens overlooking the Vale of Aylesbury and is a mix of formal gardens and innovative new design. I visited in mid summer and was impressed, but am told that the spring bulbs are well worth making a special trip for. 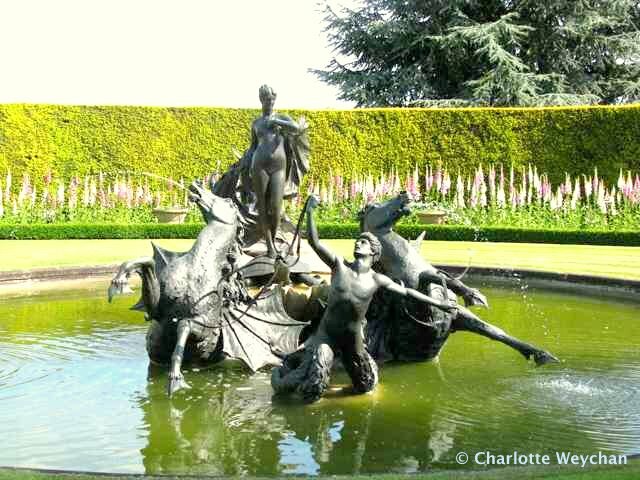 This is a garden on a grand scale, with fountains (above) sculpted by Thomas Waldo Story - an Anglo-American art historian and critic, born in Rome and married to an English woman - so it's hardly surprising his designs are reminiscent of the grand Italian style. And since it was primarily a winter residence for the de Rothschild family, much emphasis was placed on evergreen plants. 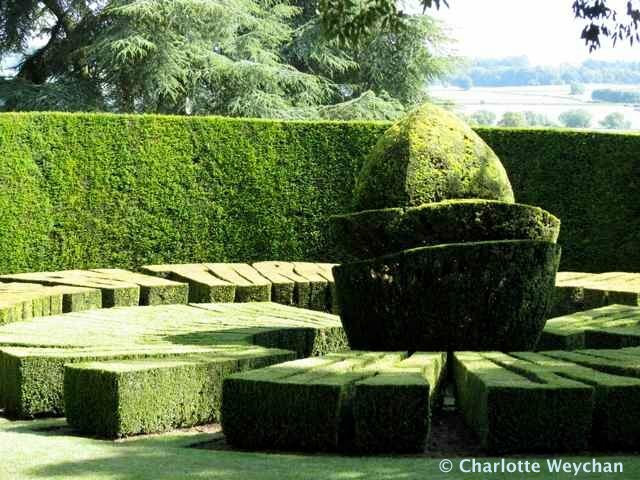 The result is astounding topiary, long yew hedges and immaculate lawns. One of the most stunning features here is the huge topiary sundial sculpted out of golden box and yew (above) which reads: "Light and shade by turn but love always". From here you get wonderful views across the Vale of Aylesbury before meandering through to the famous fountain of Venus (below), also designed by Story. The topiary trimmers certainly have their work cut out for them here at Ascott as these pictures show! 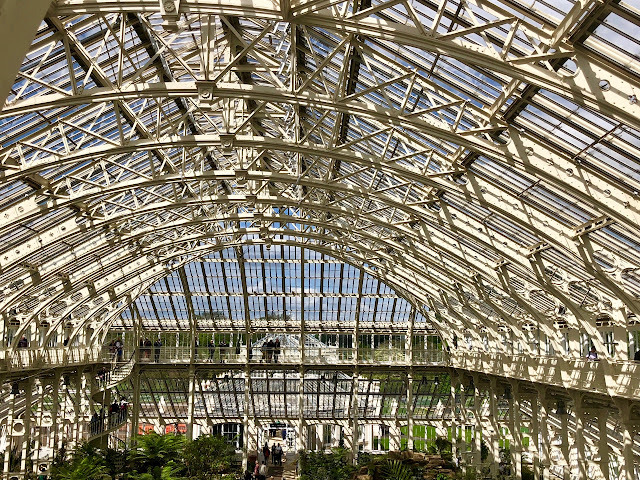 There was hardly a leaf out of place when I visited, which adds to the sense of Victorian austerity that is so much a feature of this grandiose garden. 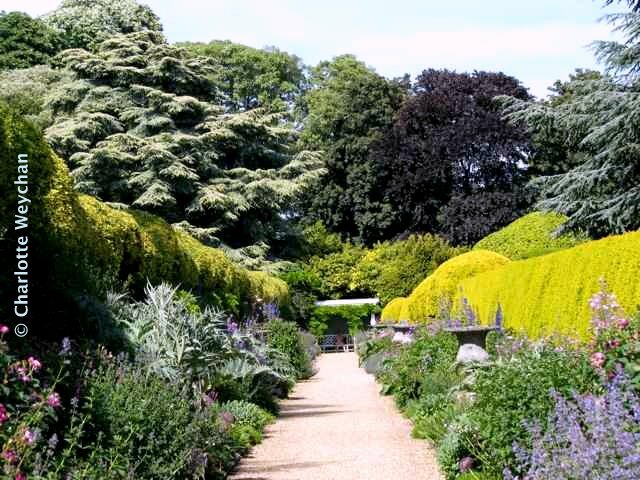 You'll find glorious borders in the formal Madeira Walk (below), backed by a hedge of golden yew, and it is here that you realise how important the trees are in the overall planting scheme at Ascott. There are huge evergreens everywhere, strategically planted to ensure that there is shape and form even in the depths of winter and I'm sure this garden is just as impressive when there is snow on the ground, even if the garden is only open to the public during the spring and summer (April to mid-September, but check website as opening days vary according to the month). Don't miss the new informal garden, added after the millennium and lily pond area at the rear of the property (below). 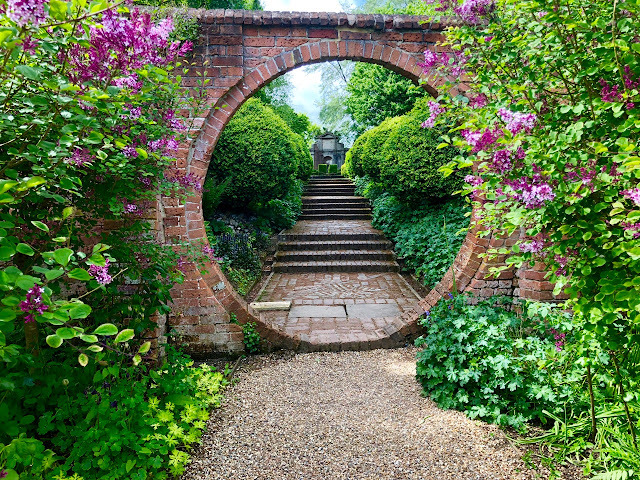 The Long Walk was reconstructed by Arabella Lennox Boyd, and there is a wild garden designed by Jacques and Peter Wirtz, with swirling grasses and concentric circles. This area is very different and quite refreshing after the formality of the main gardens. 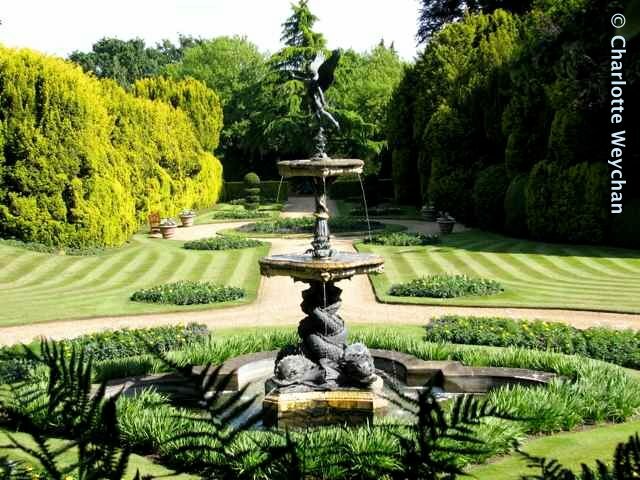 Ascott is just the first of many "grand" gardens I'll be featuring the next few months. 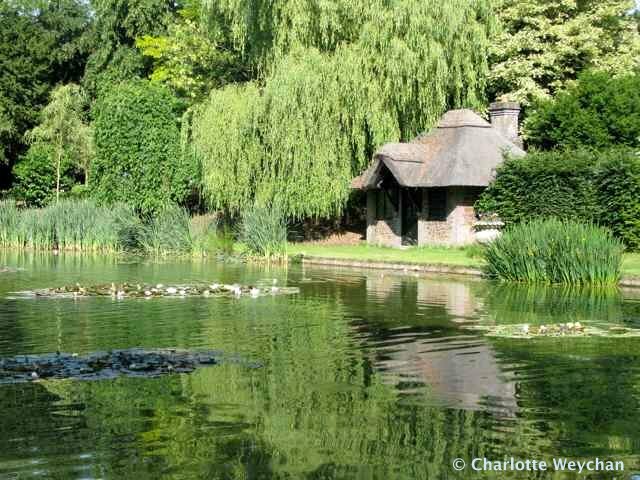 It's close to Hatfield House, Waddesdon Manor and Cliveden - all easily accessible from London and you may want to combine a couple of properties on the same day. National Trust members go free to all. Hello Tiggerlot, don't know why but thought you were in Rajasthan. Never heard of this garden before so thank you for the introduction. The yew dial looks incredible also the yellow hedge is pretty eye-catching. They must have an army of hedge clippers! Great post Charlotte, I enjoyed my visit. Ahh, this post is a delight. It's an art, love to look. But I wonder how big is their staff? I love to visit gardens with you as a guide. Beautiful pics. Your pictures have reminded me to go take a look..! Now this is one that I have not been to. Wow that topiary sundial is amazing, have never seen anything like it before!